However, fret now as Hada Labo’s AHA + BHA Face Wash is a pretty awesome face wash with functions as an exfoliator that helps wash away trapped dirt and impurities, and also cleanses your skin from deep within for a clearer, smoother and healthier looking skin. · Triple Anti-Pollution Formula- This unique formula helps to purify and protect skin against environmental pollution by reducing the ability of polluted particles to adhere onto skin. It also works by removing heavy metal pollutants and forms a protective barrier to shield skin against any damages caused by pollution. · Double Action Exfoliating Formula- The Hada Labo cleanser contains AHA (Glycolic Acid) and BHA (Salicylic Acid) to help soften skin, gently remove dead skin cells, improve skin absorption and restore its natural healthy radiance. The Hada Labo AHA + BHA Acne Control Face Wash consists of the Acne Control Formula that is infused with Wild Pansy Extract to help fight pimples for a flawless, smooth looking skin. Whilst the Hada Labo AHA + BHA Oil Control Face Wash uses the Oil Control Formula which contains the Alpine Plant Extract to aid in controlling and balancing oil production in order to minimise the appearance of large pores for a fresher and more refined skin. Both variants come with a texture similar to the Bentonite Clay - a type of mineral clay derived from natural volcanic ash with high content of minerals to effectively absorb excess oil and at the same time removes dirt and impurities on skin. 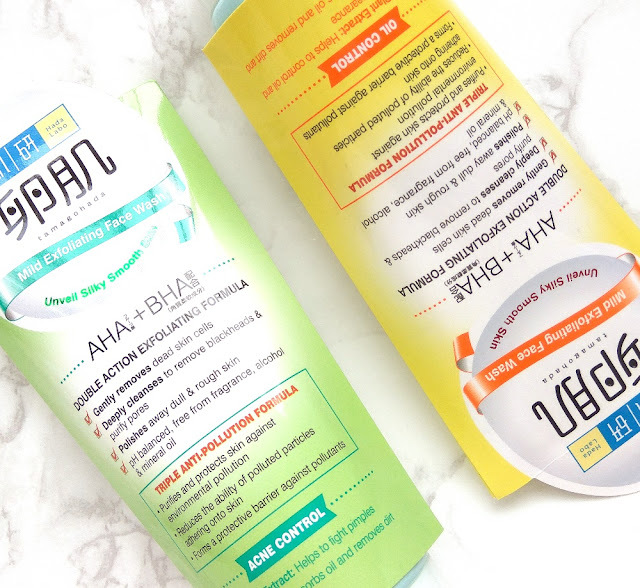 The Hada Labo AHA + BHA Acne Control and Oil Control Face Wash is pH balanced and is free from any alcohol, colorant, fragrance and mineral oils. To achieve optimum results, use it together with other Hada Labo products. Note - I am such a huge dummy.. I was about to download the pictures I took of the products at a hotel and all for my review, just right before writing this post and guess what... I hit delete instead and all my pictures disappeared, yup.. they evaporated just like that... that was certainly a smart move I made.. so the pictures here are not mine, but belong to their rightful owners as stated.. , just 'borrowing' for illustration purposes.... my apologies..
Use the Face Wash twice a day. Squeeze sufficient amount onto your palm. Lather with water and massage onto face, using gentle circular motions. Rinse thoroughly with lukewarm water. For best results you should use it daily. Retail at RM31.90, the Hada Labo AHA+BHA Face Wash is made available at all leading pharmacies in Malaysia.